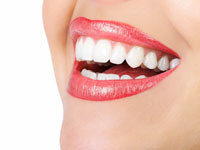 Clear aligner Straightening System can be used to straighten teeth without the use of metal braces. The system has a series of precisely calibrated aligners that remain in the patients mouths 24 hours a day, only to be removed to eat, drink, brush and floss. Roughly every two weeks a new set of aligners will be given to the patient as the teeth will be begin to shift slightly until their desired position is reached. Dr. Skowronski will meet with the patient and take a series of x-rays, impressions and photos to determine if the patient is a candidate for the clear aligner straightening system.